Misregulation of angiotensin II (Ang II) actions can lead to atherosclerosis and hypertension. 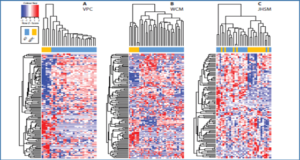 Evaluating transcriptomic responses to Ang II in vascular smooth muscle cells (VSMCs) is important to understand the gene networks regulated by Ang II which might uncover previously unidentified mechanisms and new therapeutic targets. 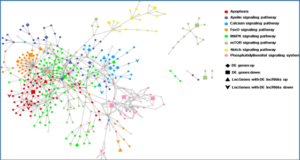 Researchers at the Beckman Research Institute of the City of Hope set out to identify all transcripts, including novel protein-coding and long non-coding RNAs, differentially expressed in response to Ang II in rat VSMCs using transcriptome and epigenome profiling. 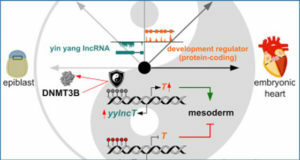 De novo assembly of transcripts from RNA-seq revealed novel protein-coding and long non-coding RNAs (lncRNAs). 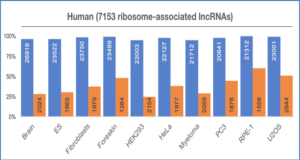 The majority of the genomic loci of these novel transcripts are enriched for histone H3 lysine-4-trimethylation and histone H3 lysine-36-trimethylation, two chromatin modifications found at actively transcribed regions, providing further evidence that these are bonafide transcripts. Analysis of transcript abundance identified all protein-coding and lncRNAs regulated by Ang II. 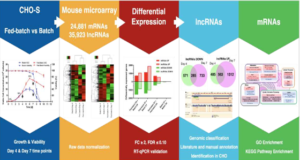 The researchers further discovered that one Ang II-regulated lncRNA functions as the host transcript for miR-221 and miR-222, two miRNAs implicated in cell proliferation. Additionally, siRNA-mediated knockdown of Lnc-Ang362 reduced proliferation of VSMCs. These data provide novel insights into the epigenomic and transcriptomic effects of Ang II in VSMCs. They provide the first identification of Ang II-regulated lncRNAs, which suggests functional roles for these lncRNAs in mediating cellular responses to Ang II. 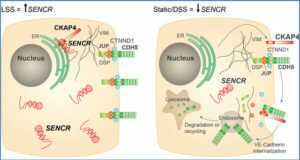 Furthermore, the researchers identify one Ang II-regulated lncRNA that is responsible for the production of two miRNAs implicated in VSMC proliferation. These newly identified non-coding transcripts could be exploited as novel therapeutic targets for Ang II-associated cardiovascular diseases.